You’ll see more grandeur and beauty than you can imagine on your visit to Bryce Canyon. Like an exciting trip back through the eons of time…a close-up look at beautiful rock formations thousands of years in the making. Formations on which wind & rain are forever working their handicraft of sculpture. To add further to that illusion of timelessness you can see all of Bryce’s breathtaking beauty from horseback – man’s oldest (and most reliable) mode of transportation! Most people who ride the trails of Bryce with us have never been on horseback before! Once you arrive at Bryce Canyon go to the lobby of the Bryce Canyon Lodge where you will be greeted by a cowboy at the trail ride desk. At this point you will be directed to the loading corral where you will be assigned the horse or mule that best fits you. You and your animal will become best friends on the ride as you leave Sunrise Point to start the descent into the Canyon. On the ride you will be informed by local cowboys of the history & geology of Bryce Canyon. On the ride you will be able to take pictures and experience the Canyon at your finger tips. Once the ride reaches the floor of Bryce Canyon our 2 hour ride will make a loop and start to travel back up to the rim of the canyon, winding through many more rock formations. If this 2 hour horseback ride sounds inviting, the three hour trip is a ride of a lifetime. The three hour trip will take you right into the heart of Bryce Canyon. You will experience such views as the Wall of Windows, The Chessmen, Silent City, and the Bristle Cone Pine Trees. Bryce Canyon National Park rides can be booked from April – October. These rides take place in Bryce Canyon National Park. Cancellation policy- 24 hours in advance of reservation to qualify for a full refund. 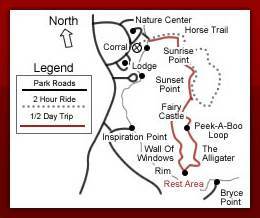 Bryce-Zion Trail Rides is an Authorized Concessioner of the National Park Service.